A British icon since 1834, WOLF is a luxe leather-goods company designing the world’s most beautiful jewelry cases, watch winders and boxes, and travel pieces. Los Angeles, CA: A British icon since 1834, WOLF continues to command attention in the luxury leather-goods market, designing the world’s most exquisite watch winders, watch boxes, and jewelry cases. 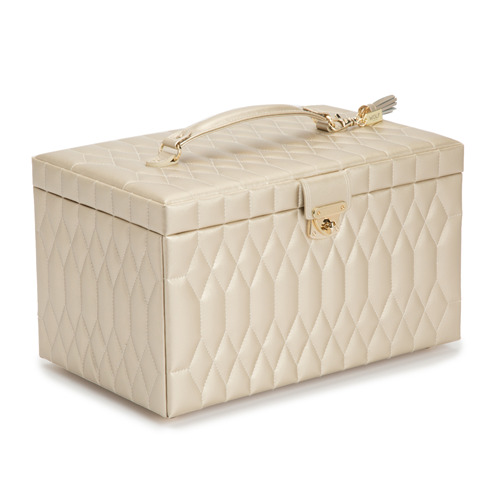 The Caroline collection is the signature WOLF jewelry case, defined by its distinctive quilted exterior and classic design. This stunning collection features gold hardware and accents combined with supple leather in ivory, rose quartz, black, red, and now introducing its newest addition, champagne. Timeless, beautiful, glamorous—champagne adds complexity and shine to the beloved Caroline collection. 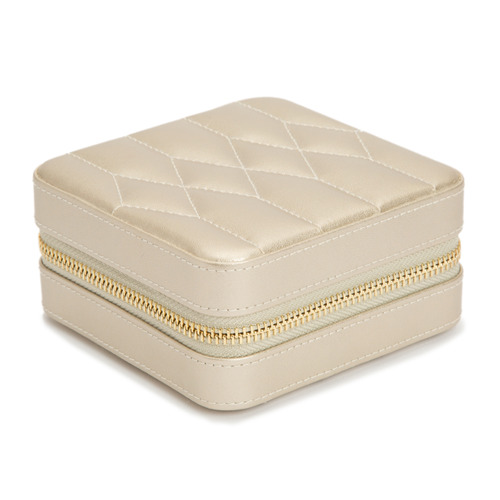 Caroline champagne features a zip travel case, jewelry portfolio, and small, medium, large, and extra large jewelry cases. Each with thoughtful storage lined in WOLF’s patented Lusterloc™, leather tassel keyring, gold finished lock, and glass mirror. Today, WOLF, in its 184th year, remains as the luxury solution for safekeeping and maintaining time pieces and luxury goods. From watch winders, watch storage solutions, jewelry cases and travel accessories, this family led company continues to pride itself on its unique technology, and hand made products that separate them from the rest of the industry. Los Angeles, CA: A British icon since 1834, WOLF continues to command attention in the luxury leather-goods market, designing the world’s most exquisite watch winders, watch boxes, and jewelry cases. Still family led, WOLF maintains their quality craftsmanship year after year, distinguishing themselves from others, with their superior patented technology and now their new collection, Axis. Powerful, sleek, sophisticated—Axis is as intricate as its timepieces inside. Custom metal plating is cut from a single piece of steel and finished in a stunning copper or black powder coat. Combined with trusted patented technology ensures your watches are protected and displayed in style. A single watch is made up of many rotating axes, working in perfect unison to tell time. The power of an Axis and the collection combines this precision and WOLF’s sleek design, making Axis the only watch winder you’ll need. The collection includes a single, double, triple, 4-piece, 6-piece, and 8-piece options to elevate your growing collection. Each with stellar grated exterior, black micro suede interior and additional watch storage, Axis’ sleek design perfectly conveys the consistent quality WOLF is known for. A WOLF winder is a handmade precision instrument. From the optimum size of drum and cuff to the technology that delivers exact turns per day, we test the tests to ensure we deliver the highest possible quality – nothing is left to chance. A WOLF winder focuses on the health of your watch with patented innovation. Only a WOLF counts rotations – all others simply use time to estimate the counts per day. Ensuring the highest commitment to quality, every WOLF winder is covered by a 2-year warranty and can be traced to birth by its serial #. Los Angeles, CA: With a breath of fresh air, WOLF releases their latest jewelry box collection, Zoe. This fifth generation, family owned company continues to surprise the market with their unique and refined designs for jewelry cases, watch winders, watch boxes, and lifestyle accessories. Exuding romance and charm, Zoe’s intricate embroidery and sophisticated design captures the decorative style of Art Nouveau. The collection radiates with luxe jewel-tone velvets, soft curves, and rounded pale gold hardware illustrating that true beauty is in the details. 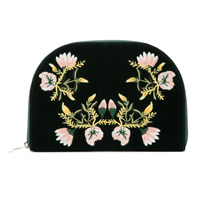 The elegant floral embroidery is unlike anything WOLF has produced to date. Combined with WOLF’s patented LusterLoc™ treated interior lining, this collection is truly handmade for a lifetime. 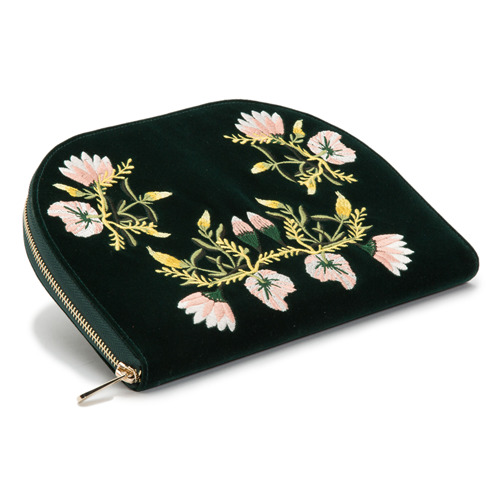 The collection includes a medium and large jewelry case, and two travel accessories in a rich indigo, mink, and forest green velvet exterior. 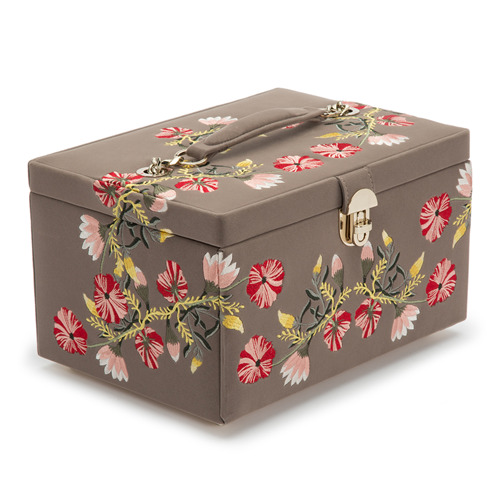 This feminine yet functional collection sets it apart from all other jewelry cases available today. WOLF, the 184-year-old British luxury leather goods company has been designing and hand-making jewelry cases, travel accessories, watch storage and maintenance solutions for over 180 years, family led by the 5th generation. With world headquarters in Los Angeles, WOLF has become the only watch winder and jewelry box company to consistently innovate and re-invent. Los Angeles, CA: WOLF’s luxury watch rolls combine the finest materials with over five generations of handmade tradition. For WOLF, perfection is in the details. Their 184 years of tradition has highlighted their masterfully built watch winders, jewelry boxes, watch boxes, and travel accessories. When you travel with a WOLF Watch Roll, you’re traveling with tradition. A fine watch roll starts with the finest leather. Navy pebble, python embossed, classic smooth black - WOLF has a finish for every style and spirit. While traveling for business or pleasure, securely pack multiple timepieces and be prepared for any occasion thrown your way. At the forefront of innovation, WOLF has developed a unique design to safely store your watches while on the go. Whether it’s utilized for a weekend in New York, backpacking around Europe, or storage at home, WOLF’s patented Watch Guards go between each timepiece, preventing scratches and scuffs. This perfect design and technology gives your watches the maximum security against damage. 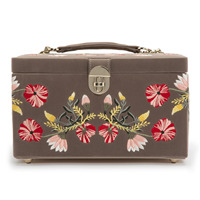 Lined with soft Ultrasuede and fastened with strong snap closures, WOLF knows travel. Grab your passport, suitcase, and WOLF Watch Roll, we’re ready for the next adventure. With five generations of continued innovation and design, WOLF’s passion has kept their jewelry cases, watch winders, watch boxes, and lifestyle accessories on display for over 184 years. WOLF remains at the forefront of luxury solutions for safekeeping and maintaining luxury goods, designing handmade products with the finest materials and technology separates them from the rest of the industry. For more information on WOLF please call +1 310.473.0012 or visit the company’s web site at www.wolf1834.com. Los Angeles, CA: A British icon since 1834, WOLF continues to command attention in the luxury leather-goods market, designing the world’s most exquisite watch winders, watch boxes, and jewelry cases. Still family led, WOLF maintains their quality craftsmanship year after year, distinguishing themselves from others, with their superior, patented technology. WOLF not only understands the importance of keeping timepieces wound accurately, and effectively, they, and only they, have the technology to support it. WOLF is the only company worldwide, that holds the patent, #7,575,367, that is used on each, and every one of their watch winders. This patent includes their invented algorithms, and technology as to how the turns are counted. What does this mean? No matter how heavy, or light a watch, the quartz eye that counts the rotations, will not let the winder stop, or stall, until it has completed its TPD. Please be advised, WOLF has not licensed this technology to anyone. There are imitators that claim they can produce similar results but merely use time within a rotation cycle. WOLF however, in business now for over 180 years, knows that relying on time, is simply never enough. Today, WOLF, in its 184th year, remains as the luxury solution for safekeeping and maintaining life’s most precious goods. From watch winders, watch storage solutions, jewelry cases and travel accessories, this family led company continues to pride itself on its unique technology, and hand made products that separate them from the rest of the industry. With world headquarters in Los Angeles, WOLF has become the only watch winder and jewelry box company to consistently innovate and re-invent. 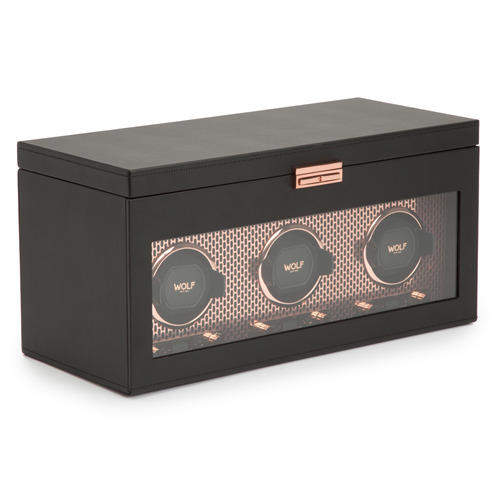 Los Angeles, CA: Designed with nearly 200 years of know-how – The 1834 watch winder safe collection delivers an elegant solution of luxury and patented innovation to safeguard your valuables and timepieces. 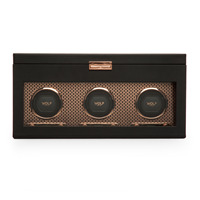 The 1834 watch winder safe is certified by the most renowned global independent safety science company, Underwriters Laboratory (UL) providing independent variafiable testing so you know your collections are secure. Trust us, trust UL. For those seeking the ultimate luxury in safes, WOLF’s 1834 Collection offers Bluetooth technology for convenient user control using the WOLF app available on any iPhone or Android device. Beautiful high gloss titanium or onyx color options with the same rotation counting patented technology WOLF is known for. Keeping your watches wound to perfection with essential security. The 1834 safe interiors include jewelry and accessory drawers lined with protective Lusterloc™ ultrasuede lining and UL certified body composition providing the ultimate peace of mind—ensuring your possessions are protected for life. The collection includes three exceptional designs, Atlas 12-piece, Vanguard 8 piece, and Orion 2 piece. Each with stellar high gloss onyx or titanium exterior finish, black watch panel, and patented innovation providing the highest level of security, luxury, and functionality. Stores your best pieces while on-the-go with 2 earring holders, 2 ring rolls, 1 medium zip pocket, 1 large zip pocket large, 4 necklace holders, LusterLoc™ lining, and a removable round mirror. Includes mink velvet exterior, LusterLoc ™ interior, 10 small compartments, 4 medium compartments, 3 large compartments, 4 bracelet compartments, 4 bracelet/watch cuffs, and removable mini travel piece. 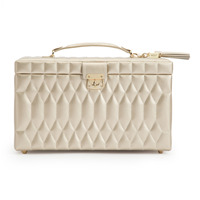 Includes quilted champagne leather, leather tassel keyring, anti-tarnish LusterLoc™ lining, gold finished lock, glass mirror, 19 compartments, 4 ring rolls and travel case with 3 compartments and 4 ring rolls. 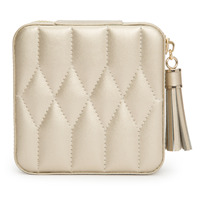 Includes quilted champagne leather, anti-tarnish LusterLoc™ lining, zip lock closure, gold finished fittings, leather tassel, glass mirror, 7 ring rolls, 4 compartments and 3 necklace hooks with pocket. Features custom copper metal plating, micro suede interior, locking glass cover, backlit LCD display, copper finished hardware, 2 watch storage with elevated cuff, 4 medium compartments, travel case and 3 winding modules.